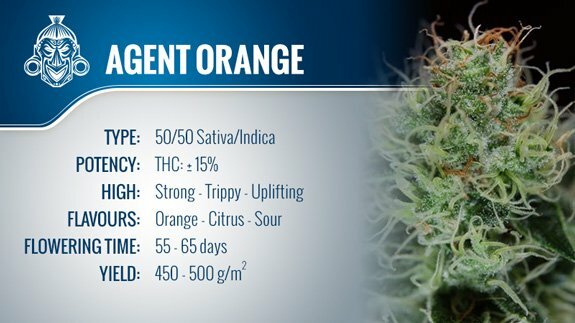 Agent Orange holds a special place in the hearts of many connoisseurs for its unique flavour. Don’t let the name fool you, although she is strong, this beauty has no intention of causing you any harm. Agent Orange has nothing to do with the weaponised chemical payload used during the Vietnam War. If anything, she is the polar opposite. Agent Orange is a highly sought after and much loved strain from the 90’s that took center stage at the High Times Harvest Festival upon its emergence. The original Agent Orange is thought to be the handy work of Subcool, a renowned connoisseur and grower who founded the TGA seed bank. Legend says, the strain was created by Subcool in an attempt to recreate Juan Moore’s strain known as 7Up. He did so by blending one of his famous Jack’s Cleaner clones with an orange skunk strain known as Orange Velvet. It was later developed further to be a blend of Jack The Ripper and Orange Velvet, Jack The Ripper being a blend of Jack’s Cleaner and Space Queen. The resulting hybrid, Agent Orange, is one that produces some top shelf bud. If the experience had to be described in one word, it would be happy; but the main draw of Agent Orange that has veterans and connoisseurs chomping at the bit is it’s unique taste - there is nothing quite like it. There are very few strains out there that can boast to being easily identifiable in a blind taste test, but the unmistakable flavour of well grown Agent Orange is one of the few exceptions. It has a strong sweet and citrusy flavour, that as the name suggests, puts forth a zesty orange taste. As mentioned, the high induced by this indica/sativa mix is one that is undoubtedly euphoric. A strong hit instills a vibrant cerebral buzz that lasts for hours. It makes for a perfect daytime smoke, and for sharing with friends - its excellent mood elevating qualities will have you all giggling and chatting the day away as you watch the world go by. It should be noted, the strong punch that Agent Orange packs may be a bit overwhelming for the unexperienced, and first time smokers should approach with caution. Agent Orange will grow well both in a grow room and outdoors - although she can grow to some towering heights, making her a bit of a handful in space constrained areas. If grown outdoors, she is best suited to warmer climates, such as those found in Spain, Italy or California. In these prime conditions, Agent Orange can reach up to 3 meters in height! And will produce a yield in line with such a mammoth size. When grown indoors, you get best results when topping and trimming the plant during the vegetative stage, to push it to the limits. In terms of flowering times, indoors Agent Orange has a flowering time of roughly 60 days; outdoors she will be ready for harvest in October. The potency of Agent Orange moves in the range between 15-20% THC and around 0.3% CBD. The average yield for Agent Orange when grown under an experienced hand will normally vary anywhere between 600 - 800 grams/m2 – it is a yield of epic proportions! In conclusion, we have to give this strain the credit it deserves. It may not be the easiest for novice cultivators to grow, but the strong and unforgettable experience on offer by Agent Orange is not one to be missed. Sampled the tantalising taste of Agent Orange yourself? Have some thoughts? Let us know in the comments below!